After you enter the doors of GNG, directly to your right is the welcome center. 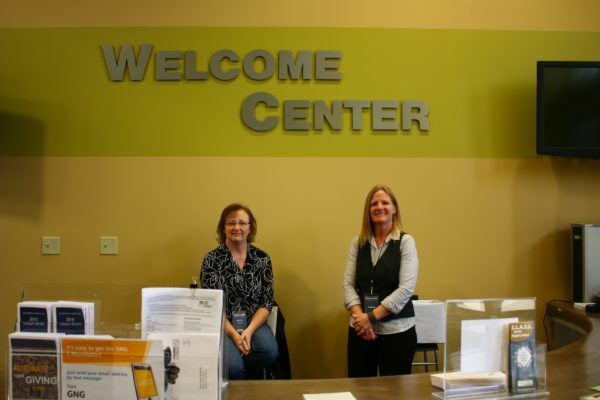 The welcome center is staffed with friendly volunteers to answer all of your questions pertaining to GNG. You can also pick up a copy of the current lessons on CD, grab any of our publications or just get general info about us. The welcome center is the place to go for lost and found or any other information you may need. If you are a new guest, fill out the communication card on the back of the bulletin, tear it off and turn it in to the welcome center for a free packet of cool things and information about GNG. Don’t worry, we will not call or visit you unless you specifically ask us to. If you enjoy assisting others, and meeting new people, then volunteering for the Welcome Center is a great way to serve.